In long-ago gardens I grew magnificent basil plants and dried bags and bags of basil leaves to keep up with the abundance. During the cold Midwest winter months I also kept little pots of fresh basil plants indoors. These days, I take a variety of leafy basil plants with me when we travel in our RV. Electric Skillet Pot Roast makes use of a tomato and basil base and it has a soothing, wonderful comfort flavor. *This recipe may also be made in a crock pot, in a Dutch oven on top of the range or in a regular oven. For my RV travel convenience, I chose to make it in the ever-handy electric skillet. While the written recipe calls for beef, the pictured dish actually made use of grass-fed, no-hormone, no antibiotic bison meat. 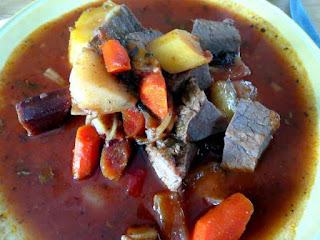 The meat was mild, very tender and delicious and I did add beef bones for a richer flavored sauce. On med/high heat, brown both sides of meat in hot oil. Turn down heat to low. Add soup, water, onion, basil. Cover and simmer for 2 hours. Cut up potatoes and carrots. Add vegetables. Recover and simmer 1 hour until vegetables and meat are fork tender. Adjust seasonings and blend in butter before serving.